We have developed new methods to manipulate cells using a.c. electric fields, with the aim of loading cells into the microvials on the cell-based sensors. This work was performed by Mario Urdaneta. Dielectrophoretic forces act on particles via dipoles that are induced by electric field gradients. DEP forces can be either attractive (positive DEP, pDEP) or repulsive (negative DEP, nDEP), depending on the a.c. frequency and the relative polarizability of the particle and the medium. In the lab-on-a-chip community, DEP can be used in flow-through sorters to separate particles based on size, dielectric constant, and/or conductivity. It is possible to design such sorters based on one figure of merit, the dimensionless characteristic velocity. Once a given electrode/channel geometry has been numerically simulated and this figure of merit obtained, future simulations for this configuration are no longer needed. 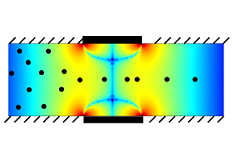 The figure shows numerical simulation results for a microchannel with electrodes on the top and bottom, where the magnitude of the characteristic velocity is given by the color (blue low, red high). M. Urdaneta and E. Smela, "The design of dielectrophoretic flow-through sorters using a figure of merit," J. Micromech. Microeng., 18 (available online), doi:10.1088/0960-1317/1018/1081/015001 (2008). Both positive and negative frequencies can be applied to a particle at the same time, since the forces superimpose linearly, using one or several electrodes. Modeling the complex DEP forces generated by multiple frequencies on multiple electrodes is relatively straightforward if one defines an effective Clausius-Mossotti factor. MFDEP allows more complex manipulations than single frequency DEP, such as separating cells with very similar frequency responses, and simultaneously trapping different types of cells in separate locations. 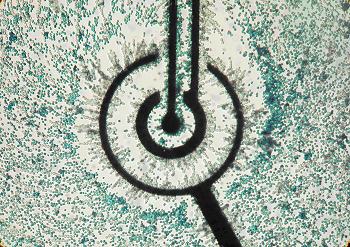 This is illustrated in this figure, which shows live (clear) and dead (blue-stained) yeast cells. Far from the electrodes (black), the white and blue are mixed. Between the small inner electrode and the center electrode there are only blue cells, and between the inner and out electrodes primarily white cells. Each has been selectively and simultaneously attracted to a particular place. M. Urdaneta and E. Smela, "Multiple frequency dielectrophoresis," Electrophoresis, 28 (18), 3145-3155 (2007). Figure from M. Urdaneta and E. Smela, "Multiple frequency dielectrophoresis," Electrophoresis, 28 (18), 3145-3155 (2007). Materials with complex permittivities that are different from that of the fluid medium cause distortions of the DEP fields, and this can lead to “parasitic trapping”. In other words, microstructures create field gradients that can interfere with the desired trajectories of cells. 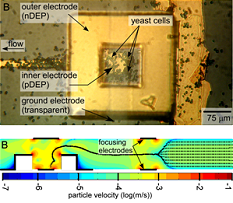 Therefore, placing a pDEP electrode inside a microvial, shown as white in the cross-sectional image, does not pull cells into the vial, but instead results in the cells collecting on the corners of the vial walls. The black dots illustrate simulated trajectories for cells travelling at different heights in the channel. This result is seen experimentally also. The red-colored parasitic traps at the corners can be cancelled with a third electrode on the top of the vial that exerts nDEP. This is also seen experimentally, as shown in the figure. Combining this with particle focusing using two additional nDEP electrodes upstream of the vial should result in 100% loading of cells into vials. Parasitic trap cancellation enables DEP-based loading of cells into boxes on the surface of a wafer. Previously, this type of manipulation has been done using laser tweezers, or by hand. Using DEP, we can load different types of cells into an array of vials in only ~ 1 min. 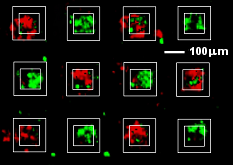 As an example, two batches of cells labeled with green and red fluorescent dyes were loaded sequentially into different vials in a checkerboard pattern, as shown in the figure. Top view of an array of boxes into which cells labeled with one of two fluorescent dyes, flourescein (green) or Texas red, were sequentially loaded.